See also: What is Learning? Over the years many theories have been developed to examine the processes involved in learning. Most learning theories concentrate on the significance for the way that learning is delivered. There are many different ways of learning both formally and informally: as part of a group, such as in a classroom setting, one-to-one, such as in a mentoring or coaching arrangement, and self-learning. Furthermore people learn differently at different times in their lives and in different circumstances. This page examines the three main learning approaches. Most learning theories fall into one or more of these approaches. which is concerned with learners responding to some form of stimulus. based on knowledge and knowledge retention. based on explanations of individual experience. This approach to learning is based on the idea that learners respond to stimuli in their environment. The role of the learning facilitator, therefore, is to provide relevant and useful stimuli so that the learner responds to and gains the required knowledge or experience. The behaviourist approach to learning centres around the belief that appropriate behaviour can be taught through constant repetition of a task combined with feedback from the facilitator. Positive feedback encourages and reinforces success while negative feedback and immediate correction discourages the repetition of a mistake or undesirable behaviour. In 1927 Ivan Pavlov conducted a famous experiment with dogs. Pavlov 'taught' the animals to salivate on hearing a ringing bell by linking the time of their feeding to the bell being rung. Later he stopped feeding them in this way, but the dogs continued to salivate when they heard the bell. In other words, the learned behaviour was a result of a sequence of events experienced, rather than a conscious thought process. Pavlov discovered what is now termed ‘classical conditioning’. This kind of conditioning can be used to develop repetitive actions within training, for example looking in the mirror and putting your seatbelt on before driving off in a car. The association between stimulus-response can be made more effective by reinforcement. It is this idea that underpins the theory later developed by B.F. Skinner (1957). Reinforcement can work in both positive and negative ways. A positive reinforcer is anything that strengthens the desired response. In training, where the aim is learning, for example, this might be stimulated by verbal praise, a good mark, or a feeling of achievement. On the other hand, if verbal praise is withdrawn, this will have a negative effect and motivation to learn will decrease. One of the main ways to use the behavioural approach to learning in training and teaching is to specify clear behavioural objectives at the start and then supply learning opportunities that ensure that the objectives are met. The approach is also based on the view that there is one right way, one truth that the student needs to learn, and that knowledge is the same for all learners. For this reason it emphasises teacher or trainer control; the trainer employs external reinforcement to motivate and encourage trainees to reach the stated objectives. A more recent proponent of the behaviourist approach can be found in the work of Gagné. In his theory of instruction, Gagné suggests that learning takes place in a hierarchical way. He proposes an eight-stage model, each stage of which is associated with a type of learning that influences the way that instruction is delivered. Gagne says that learning at one level is only possible if learning at a previous level has already taken place. Signal learning/recognition (recognising that something is happening). Stimulus/response learning (learning the response to the stimulus). Motor chain learning (learning the sequence of actions necessary). Verbal chain learning (associating words in sequence). Multiple discrimination (choosing relevant responses to particular stimuli). Concept learning (making a common response to a class of stimuli). The social learning theory is a development of early behaviourism theory. It proposes that people can learn, both directly and indirectly, by observing others. In order that this learning becomes absorbed into their repertoire of behaviours, it needs to be positively reinforced. Attention is focused using a model (e.g., a child and a parent). Learning takes place through observation of the model's behaviour, and the consequences of this (e.g., the child watches the parent use the telephone). The subject analyses and codes the learning. If imitation of the model is possible, this will help in the reinforcement process (e.g., if the child can copy the parent's actions, the learning will be reinforced). The social learning approach places great significance on learning with other people, through interpersonal interactions, either face-to-face or in a team. One problem of this approach is that people do not copy everything they see but, as individuals, tend to be selective about what they choose to copy. It is therefore important for others to demonstrate best practice while using this approach to training and pick up on mistakes quickly. Behaviourist theories of learning essentially stress the importance of the assertiveness of the tutor, and the passive participant who is not given a great deal of choice other than to respond in a predetermined way. In contrast cognitive theories are concerned with the role of the active mind in processing learning opportunities and developing. The tutor (if present) and the participant both engage with knowledge; the role of the tutor is choosing the best method to convey understanding. Dewey (1938) believes learning involves 'learning to think'. He says the process of learning is more than doing a task or activity; it also requires reflection and learning from this. To Dewey, the purpose of thought is attaining a state of equilibrium, enabling an individual to solve problems and to prepare them for further inquiry. Often associated with 'progressive education', Dewey rejected traditional forms of education based on the reinforcement of information where the student has a passive role, suggesting that this type of learning was superficial. He said that learning only occurs if the student plays an active role in the process. For learning to take place it must be meaningful to each individual, with students critically reflecting on information presented; they have to be able to 'experience' the information and the way to facilitate this is to draw on past experience. It could be argued, therefore, that Dewey was one of the foremost proponents of experiential learning. Teachers or trainers employing Dewey's approach to learning play a key role in learner's development, but in a more indirect way than that implied in the behaviourist model. For example, planning sessions that encourage interaction with the material presented and reflective thinking, as well as creating a climate whereby students or trainees can structure their own learning. Another theorist who developed the cognitive approach, Bloom, considered learning occurred in both the ‘cognitive domain’, that associated with memory and understanding, and the ‘affective domain’, how feelings or emotions change as a result of learning. Bloom suggests that parallel learning between the cognitive and the affective domains takes place in a cumulative way depending of the degree of difficulty. The degree to which learners use the cognitive and affective domains will depend on the individual. Bloom, B.S. (1965). Taxonomy of Educational Objectives: The Classification of Educational Goals. New York: David McKay Company, Inc. The more recent humanist theories take into account the way that, in our society, previously polarised views of right and wrong have dissolved into a variety of potentially equally valuable truths, i.e., a pluralistic approach. The stress on valuing diversity in many organisations and in society generally is a reflection of this ideology. An emphasis on active learning is at the core of these humanistic approaches to learning. The terms 'andragogy' and 'pedagogy' highlight the difference between earlier models of training and the more usual approach nowadays. Pedagogy and andragogy are terms derived from the Greek words meaning 'child' and 'man' respectively. Pedagogy is essentially based on instruction; knowledge is transmitted formally from one who knows to one who does not know. This type of model has often been used in institutional settings, where it can be administratively easier to assume control of the learning experience, while ignoring the ability or needs of the person to engage in self-directed learning – for example in schools and other educational establishments. Unfortunately, this model can engender resistance or rebellion, particularly in older children, adolescents and adults. It could be claimed that pedagogy actually misses the point: providing training or education does not necessarily mean that the learner will enjoy or remember the experience, even less transfer it to useful settings. Andragogy, however, provides us with a process model in which the learner discovers knowledge at a pace to suit him/herself, supported by a facilitator, perhaps a coach or mentor. The learner needs freedom to develop his/her own learning. The existing experiences of the learner are fundamental for understanding and new learning to take place effectively. The person needs to be ready to learn, as opposed to being motivated by fear or coercion. The orientation to learning is paramount: in other words, it is not subject-orientated but learner centred. Informal individual support is important in andragogy theory, as is the development of a group environment that is both positive and accepting. Sharing experiences can deepen individual learning, not only for cognitive (intellectual) processes, but also affective (emotional) processes. Participative methods build on both individual and group experiences, aiding reflection, lengthening the span of attention and increasing self-awareness. Learning in this way is often referred to as 'experiential learning'. The experiential model of learning that David Kolb proposes, underpins much of the work of modern adult training providers. Essentially, Kolb believes that learning is a dynamic process, in which we are constantly able to construct our own learning and development by moving through the following cycle. 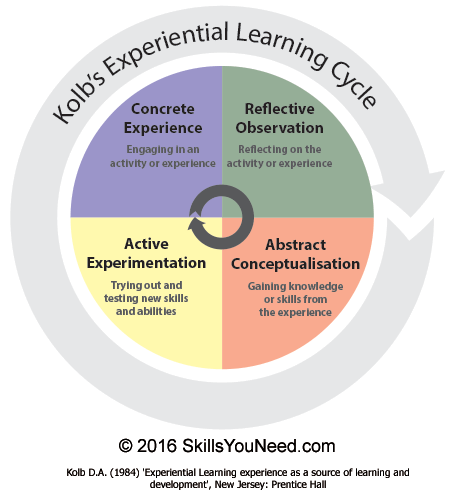 Kolb’s four aspects of his learning cycle, in which experience is constantly reviewed and impressions challenged or confirmed, form the basis of experiential learning theory. The sequence is explained in the following way: a person's life experiences form the basis for his/her observation and reflection on what has been encountered encourages learning. This in turn becomes assimilated into what is already known, providing a new conceptual map on which further actions will be based, thus forming a new experience. To complete the cycle, people also need to be able to practice skills learned if the training is to have any true meaning for them. In training terms, therefore, learning is facilitated if the course content and process key into participants' existing experience and are so designed to encourage reflection and the formation of new concepts. Albert Bandura was a key proponent of social learning who also popularised the notion of self-efficacy. Bandura's theory takes into consideration how people perceive themselves or how they appraise their own level of competence in the process of learning. People low in self-efficacy will dwell on their perceived inadequacy and the difficulties of their situation. Conversely, people high in self-efficacy will see a situation as a challenge rather than a problem and focus on what needs to be done. They manage threats well and can apply their knowledge to different situations. The Amount of Effort and Persistence a Person puts into a Task: For example, if a person starts an activity with weak expectations, or self-efficacy, but this is followed by positive experiences, they are more likely to persevere. However, individuals who have strong expectations will continue to persevere despite negative or dissuading experiences. The Actions or Tasks People Choose: Individuals will be more inclined to undertake tasks in which they have strong expectations and less inclined to do those linked to weak expectations. Bandura, A. (1977). Social Learning Theory. Englewood Cliffs, NJ: Prentice Hall. Performance Accomplishments: These are the most dependable source of efficacy expectations because they are based on one's own personal experience. Successes raise mastery expectations and repeated failures lower them. Vicarious Experience: Watching others undertake feared activities without negative consequences can create more positive expectations in observers. This is sometimes referred to as 'modelling'. Verbal Persuasion: Individuals can be led to believe they can cope successfully. Expectations created in this way, however, tend to be weak unless accompanied by an authentic experiential base. Emotional Arousal: People partly rely on their physiological arousal to judge anxiety states. High aversive arousal tends to debilitate performance whereas with calm or low arousal, success is more likely. The implications for training design are various and include setting realistic, but not too easy goals, in order that people can feel they have achieved something, and ensuring that people have support and reward for their learning in either in workplace or in other training and learning environments. Teaching Skills | What is Coaching?